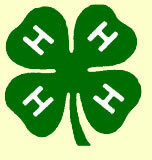 When I heard that 2006 National Specialty was going to be in Wisconsin, something was telling me that I should go, see, and participate at the Nationals for the first time. I had no idea what the Nationals entailed and entered Certik (my first dog ever) in pretty much everything I could in both pre and post-trials. When it came time for the Nationals we stocked our RV with every conceivable thing we could think of (this being our first RV trip of course) and we were off on our journey. Our 3-month-old baby (Adam) made our trip even busier and more exciting. At least Adam was helping a lot by just being a good boy and ignoring the wind and rain we had on some days. I grew up in Europe (Czechoslovakia) and only a couple of years ago discovered various dog sports that caught my attention right away. I educated myself, visited a few shows and became Certik's trainer. Living on a large farm in Indiana allows me to train in tracking, agility, obedience and some herding mostly at home and we moved from Novice to Advance in all venues within a year. My husband Robert is the tracklayer, jump builder and obedience judge all in one. Certik (WTCH Petersranch Black Bear X Four Bar X Sidney) was born to work and he did show his love for the livestock at the Nationals. He is such a fine dog; so powerful when it comes to working cattle, and yet so gentle when he is around our baby. He is a quick learner and there is not a trick or task he cannot learn. 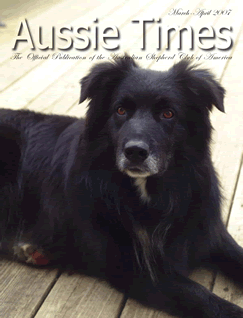 Certik was featured on the cover photo of the Aussie Time Magazine, March-April 2007 issue for receiving the Most Versatile Aussie (MVA) award at the 2006 ASCA Nationals. Certik's mission in life is to please and protect us and that's what he lives for. It is so much fun to work and play with Certik. He is ready to work or play at any time and any hour. His favorite toy is a Frisbee and doing freestyle. I am so lucky to have Certik, he is so special and unique, so friendly and loving, so hard-working and biddable. He is a true family working companion. I always admired Certik's versatility, but never dreamt of winning the MVA under age 3. We still have a lot to learn and a lot to achieve in next few years and we are both looking forward to every challenge that comes our way. Certik found his place on our farm and in our hearts as soon as we brought him home. It all started 4 years ago when his breeder was not able to sell a black pup with minimal white markings. Initially, I was not interested in a black male pup myself. I had my heart set on a blue merle female. Certik joined us later on as we felt sorry for him and decided to adopt that unwanted black puppy. Certik was one happy and loving pup, and in a heartbeat he learned all kinds of tricks, how to catch a Frisbee and win our tugging game or bring runaway cattle back in their pasture. From the start he was extremely smart and very biddable. Over the years we have learned how to read and respect each other and we have became one strong team. Certik has matured into a very handsome, intelligent and athletic dog with tons of natural herding instincts that makes him a valuable farm dog and indispensable family companion. Please e-mail us about future breeding plans or visit our website at www.turkeyrunfarm.com for up to date photos, pedigree and stud service from a “One in a million” aussie. 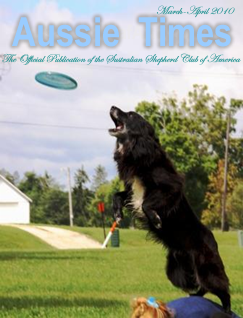 Certik was featured on the cover photo of the Aussie Time Magazine, March-April 2008 issue for receiving the Most Versatile Aussie (MVA) award at the 2007 ASCA Nationals. My road trip to the 2008 ASCA National Specialty in Las Vegas, Nevada was an unforgettable journey. Just me and my two furry friends: Certik and Misko (Certik X Trouble pup) drove for days on the seemingly endless highways. These two guys both traveled extremely well and we all enjoyed the frequent Rest-area stops where we relaxed, played ball and threw a lot of Frisbees. Las Vegas is a very busy city, but we managed to find South Point Complex without any major difficulties. I tremendously enjoyed all the Pre-trials and National trials. Certik’s performance was once again beyond my wildest expectations and to say the least, spectacular. Certik was focused, fast and yet so careful not to make any mistakes. And for the 3rd year in a row, he was unbeatable. Certik is the most intelligent, playful and happiest dog you could ever imagine. I am so blessed to have such an incredible partner to work, train and to compete with. 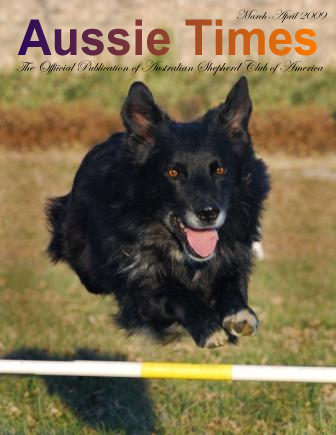 Certik was featured on the cover photo of the Aussie Time Magazine, March-April 2009 issue for receiving the Most Versatile Aussie (MVA) award at the 2008 ASCA Nationals. The one and only Certik did once again exceed everybody's expectations at the 2009 ASCA National Specialty in Greeley, CO by winning for the fourth consecutive year ASCA Most Versatile Aussie Award. Utility B and Open B Obedience runs with a smile on his face. Certik was featured on the cover photo of the Aussie Time Magazine, March-April 2010 issue for receiving the Most Versatile Aussie (MVA) award at the 2009 ASCA Nationals. When Becky from Rising Sun Farm decided in 2007 to use my Certik (WTCH ATCH OTCH Certik-Bertik TD UDX RTDcs and 4 times MVA winner) for breeding to her lovely Dolly, I talked her into shipping also her blue merle Trouble (WTCH Hangin’ Tree Trouble) along with Dolly. Trouble and Dolly came in heat at the same time so why not to breed both girls to Certik. Shipping both females turned out to be not such a bad idea as Dolly never got to get bred at that time and Trouble ended up having 6 pups. I knew in my heart that this cross was very exceptional, but I was not ready for a new puppy. It all changed, when I noticed on Becky’s website that she still had had two blue merle male pups available. Temptation took better of me and puppy #6 was shipped to Indiana where we lived at that time. I named the little wiggle-but Misko (Mike in English). Misko turned out to be a very powerful and confident working dog with tons of desire to do anything and everything I have asked him. He loves herding as much as he loves Agility, Obedience, Tracking or just catching Frisbees six feet in the air. He wants to do it all (just like his daddy)! A dog with such a big heart and so much drive is very easy to train and work with. It has been a very pleasant and rewarding experience so far. My sincere “Thank you” goes out to Becky at Rising Sun Farm. She is a very experienced breeder who tries and knows how to preserve the finest working quality in Australian Shepherds. Misko was featured on the cover photo of the Aussie Time Magazine, March-April 2011 issue for receiving the Most Versatile Aussie (MVA) award at the 2010 ASCA Nationals.